"The world's oceans are key to sustaining life on the planet. The ocean constitutes a conduit for ninety per cent of the world trade, and for connecting people, markets and livelihoods. In light of the ocean's interconnectedness, all nations of the world should strive to make the oceans places of safety and sustainability of maritime activities for all humankind. Humans, however, have put the oceans under risk of irreversible damage by over-fishing, climate change and ocean acidification (from absorbed carbon emissions), increasing pollution, unsustainable coastal area development, and unwanted impacts from resource extraction, resulting in loss of biodiversity, decreased abundance of species, damage to habitats and loss of ecological functions. 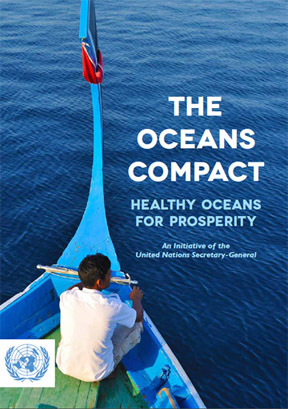 The Oceans Compact is an initiative to set out a strategic vision for the UN system to deliver on its ocean-related mandates, consistent with the Rio+20 outcome document "The Future We Want", in a more coherent and effective manner. It aims to provide a platform for all stakeholders to collaborate and accelerate progress in the achievement of the common goal of "Healthy Oceans for Prosperity."